With everyone in the base essentially quarantined, chaos is erupting – lots of fighting between crewmembers. Mia is starting to think that everyone is conspiring against her, that they’re all trying to stop her from going through the evidence and uncovering the truth behind her father’s death. She’s going through it all in her head – the weapons, the pills at the scene, the wounds on her father and then WAKE UP! Raj tells her that Aaron didn’t kill Jerome after all, that he’s still alive, still down there with them and making a big mess out of everything he can. He tells her that Alain and the surface team are right, that they’ve been exposed to something, a contagion. Raj needs help from the others in controlling Jerome. Roger, Q and Mia head towards Raj, bickering about the situation along the way. Roger keeps the lines of communication open with the others in the sub, the other remote sub still watching them. Those on the sub take out the remote sub, removing its ‘eyes’ and cutting out the surveillance. They don’t have enough power left in the sub to surface, so they cut the lights and go quiet, heading carefully to the ocean’s floor. They head through the boneyard, past a giant squid and into that cave – at least there’s oxygen there. Eventually Mia and her team reach Aaron and Jerome, who is babbling about jellyfish and how their electrical fields work to lure large prey like a whale to the giant squid, the jellyfish benefiting from being able to eat the smaller fish the in turn feed off of the whale. The sea spiders in turn pull the scraps from the floor into the cave where their master, a turtle that has grown so big it can’t leave the cave, lies. We flashback to when Mia met Alain for the first time when he was working for his dad, right after she lost her mother. Hari talks to Blake at the same time, he needs a break from all of this – not the work, the water. That’s when he decided to go into space. Mia and Alain get involved romantically once she comes back from the space exploration mission, but then she leaves Paris for London to do forensics work. But back in the present? The base is collapsing, they’re running out of time. In the water above the base a school of sharks feed no one of their own. A feeding frenzy breaks out and the unlucky shark who made a meal for the rest of them falls to the bottom of the ocean, little more than a skeleton once the others are done with him. Flashback to India where a conference is being held where various medical and scientific experts are attending a presentation being given by Hari, Mia’s late father. This is where Jerome met the man for the first time. We learn how their mutual passion for science and understanding led to a fast friendship. Hari gave Jerome a job, introduced him to Philip, one of his most important financial backers, who wanted to bounce some ideas off of him. It was during this conversation with Philip, where they discussed parallel universes and string theory, that Jerome realized he was just as insane as Philip was. From there, Hari introduced Jerome to Blake, a man that literally had everything and as such was sort of a living experiment. They discuss virus’, possible cures for them and how Blake believed that eventually mankind would have to go to space to escape the fatal germs on Earth. It doesn’t go well. Philip liked Jerome but Blake didn’t, he objected to his social awkwardness and Blake threatened to withdraw funding for Hari’s space project if Jerome went along. As such, Jerome was left behind. Mia and the others in the escape sub are heading towards the cave but coming in ‘hot’ though – the oxygen mix is off, too much helium. The rest of the crew, already in the cave, are dealing with a CO2 issue and trying not to asphyxiate. Aaron’s behavior is starting to get strange through – he’s not interested in putting his diving suit on, he says this is where they ‘need to be’ and wants them to go further into the caves. Lily isn’t doing much better, muttering to herself about letting them take the weakest and trying to take Raj out with a rock. Mia, Q and the rest hear the struggle over the radio. Mia flashes back to her love affair with Alain, the time they spent together in Paris where she told him she was done, not going back, that she hated the water. He supported her decision and hoped she’d stay in Paris with him, but she’d already decided to take a position doing forensics work for Scotland Yard. From there we see her during her time in London, investigating the attempted murder of a courier who leaked contagion formulas to enemy agencies. Does this tie into her last case, the poisoning of a Russian scientist? She stays in touch with Alain who heads to Australia to work with Blake. He’s crazy but he’s rich and can fund their work. He invites her to visit in Australia and eventually she does, much to Alain’s surprise. Given that it was just that – a surprise – Mia’s only semi taken aback by the evidence in Alain’s room, Lily’s necklace in particular. But there are bigger issues, for Mia at least – she’s upset that Blake is funding her father’s oceanic expedition when she feels he should be going back to finish his work in space. These memories, and a lot of others, play over in Mia’s head as the descent continues. She realizes that after all this time these motivations and ‘friends’ were her father’s, not hers. Everything leading up to the knowledge of her father’s death plays out before her like a surrealist film causing her to seriously question just what it is she’s been doing all this time. As the sub putters about near the ocean floor, the big fish eats the little fish and goes about its business. They try to turn off the light on the submarine but it’s not happening, there’s a malfunction. Though they’re almost at the cave, at this depth they don’t want to be seen. We’re told this as we see the sub follow a path that looks suspiciously like the long, tentacle laden limb of a giant squid. They’re running out of air and running out of energy but they’re close, Q thinks they’re going to make it. As they sit in the sub, Mia thinks to herself about her father’s murder, how most of the world won’t notice, let alone care, about what happened to him. Even those that knew of him didn’t really know him, she thinks. We flashback to her younger days, when he wasn’t around that much. We learn how Mia learned more about her father from old magazines and journals then from interaction with the man himself. We learn, through Mia’s reading, how Hari was curious kid who got in trouble at a young age for breaking into the museum, how during the war with Pakistan ancient treasures were found that he worked to save, how as a kid he’d dive for pearls to make extra money, leading to his love of the water. We learn how he and Roger developed the Dept. H team, a group of likeminded individuals equally as excited as he to travel the world and see all that they could see. We learn more about his work with Roger, the cameraman that followed him to the ends of the Earth and back, how Roger lost his legs on a dive, his work with philanthropists Blake Mortimer and Philip Kay and we learn of his attempts to balance his professional life with his personal life. We also see Mia reading her mother’s journals, written while she was having some health problems, in which she talks about her love for Hari, how those early days together were so exciting and filled with adventure. She talks of Hari’s gravity, his pull and his seemingly endless energy and infectious enthusiasm. She also speaks quite bluntly about the fine line between Hari’s skill and knowledge and his blind luck. It all changed after Roger’s accident and it began to take its toll on everyone around him. Everyone is in the cave, but it’s not a good scene. The CO2 build up is driving certain people crazy, Lily and Bob are losing it. They need to use their dive suits. Those that aren’t yet affected by the buildup get the helmets on those that are, but Aaron, he went over the cliff. There’s a rope and anchor handy so Mia decides to rappel down the side of said cliff to see what she can find – and hopefully bring him back in one piece. She finds him on the back of what appears to be the giant turtle that’s been making appearances in the series for a while now, and manages to bring him back up to where the rest of the crew is waiting for them. While Mia’s been playing rescue squad, the sub has been recharging. While they wait for the charge to build, Q asks Mia to check on Aaron and make sure he’s okay. She does, and fills him in on what happened to Jerome. When Mia sees Lily typing something on a tablet, we flash back to when she was younger. Here we learn how Lily was taken on by Hari as a protégé. Despite being a young girl she had a real knack for programming. The fact that her dad was dead and her mom a drunk made it easy to basically adopt her. She and Mia became fast friends. They were the same age and Lily’s skills came in handy when they decided to break into the hold via the electronic lock and gorge themselves on cookies. “We grew up together like sisters” we learn. Things with Mia’s brother Raj weren’t’ always so hunky dory though. And then the relationship sours when Mia finds out that Lily had messed with her father through a series of emails, emails that her mother read and that got her quite upset. As the girls got older, they grew apart. Mia was all that Lily had, but Lily was not all that Mia had. Lily just wanted what Mia had, and if that meant Alain, then that meant Alain, but obviously that wasn’t going to go over well even if Lily meant no malice, at least up until a certain point in time where clearly that was not the case. We see a kid, a boy, climb out of a huge pit full of corpses. The ‘camera’ pulls back and we see that there are scores of people surrounding this pit and that surrounding those people is a huge fence with the word QUARANTINE posted on it every other panel or so. These people are sick and the powers that be are using this plague as a reason to wage war with one another. Scientists believe this to be the natural progression of the H-Virus, but it isn’t stopping people from killing each other anyway. Back underwater, Lily explains this to the rest of the crew. If Hari found the cure for the virus as they suspect, they have no choice but to try and resurface. The fact that surface control said they’d ‘scuttle’ them if they tried to surface can’t stop them from trying, there’s just too much riding on this. 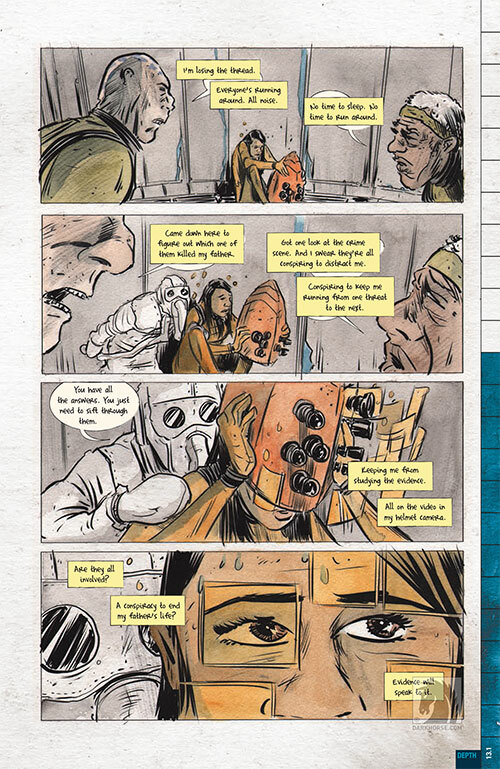 While this is going on, Aaron, out there alone in his dive suit, radios Mia and explains to him that while he and her father disagreed on many things, he didn’t kill him. He admits what he did wrong, and then explains to her how he found God. We flashback to Hari’s last days, how Aaron tried to save him, they have a heady conversation about creationism and evolution – Aaron’s point being that something can’t come from nothing, an argument that Hari can’t overcome. Hari admits he wants Aaron to be right, to believe that there’s something out there for the spirit once the body is done, but he finds the idea of heaven and living forever even more frightening. After their conversation the station floods. We cut back to Aaron, he’s found a way to boost his suit and is determined to get Hari’s cure to the surface. He has a better chance of doing this alone than the group does… and then his radio cuts out. As it turns out, that’s the least of their problems. A lot of the foreshadowing from the last few issues pays off in this latest chapter. It’s tough to go into detail about how and why without spoiling it, but those who have been paying attention to the series will already know that Kindt’s story has been working in the presence of various creatures for a while now. Here we find out why, how it affects the characters and, quite possibly, the entire world. This issue ends on a massive cliffhanger with literally the fate of the planet hanging in the balance, and it’s seriously gripping stuff. At the same time, the backstory for Aaron, his discussions with Hari, these shed welcome light on both characters and the book is all the better for it. The more we get to know these people the more interesting they become and as this happens, the events that happen in the present, fleshed out by what has already happened in the past, have a much stronger impact on the reader. It’s great stuff. 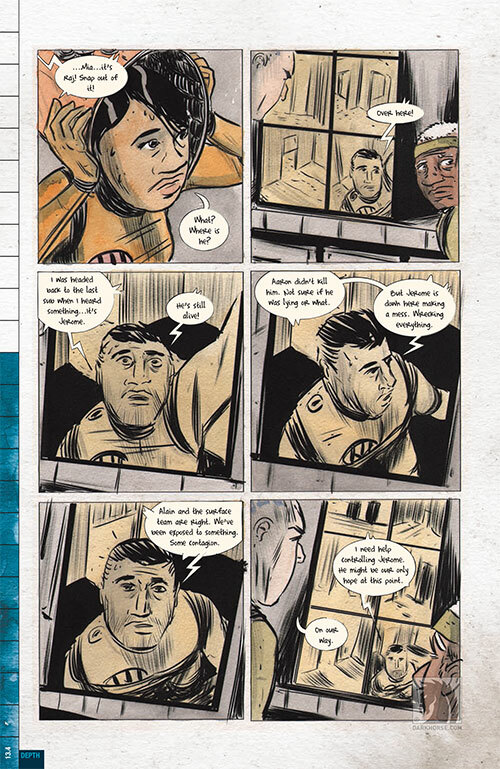 Again, Matt Kindt’s artwork, beautifully colored by Sharlene Kindt, is fantastic. His style is unorthodox but no less effective for it, there’s loads of detail and lots of interesting little bits and pieces worked into different panels that make this an absolute treat for the eyes. Don’t miss out on Dept. 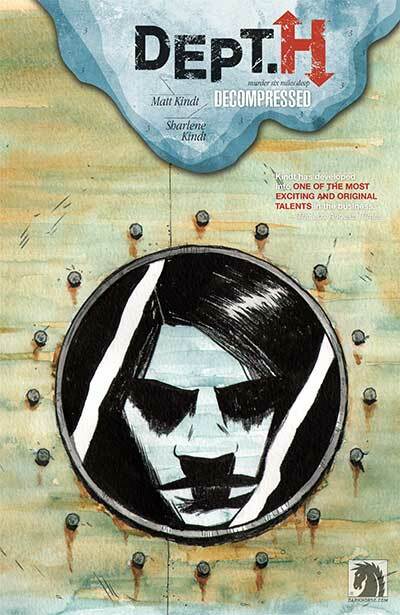 H. This is smart, suspenseful storytelling unlike anything else out there right now. In addition to collection issues thirteen through eighteen, this third volume of the collected Dept. 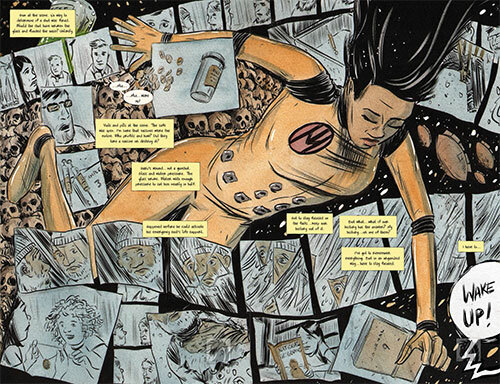 H also features some character sketches and single page pieces that tie into the narrative as well as the front and back covers from each issue.